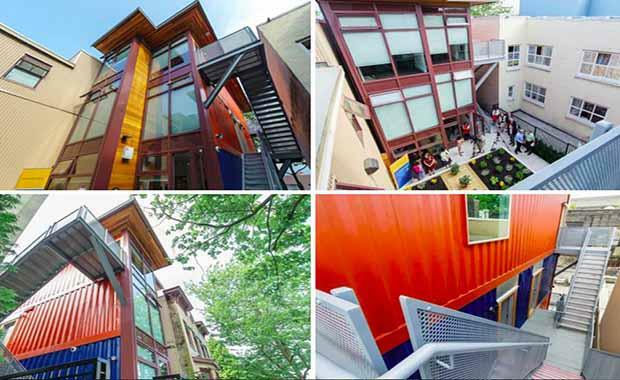 In Vancouver’s Downtown Eastside lies Canada’s first recycled shipping container social housing development. At 502 Alexander Street, Vancouver, 12 shipping containers have been transformed into studio units, ranging in size from 280-290 square feet, with fully equipped kitchens, bathrooms and laundries. The innovative idea stems from the city’s need to transform social housing for single mothers and low-income senior women living in the region. The complex was developed in eight months, at the cost of US $82,500 per unit. The 12 recycled shipping containers form the base structure for the unique three level, 12 self-contained unit development on a standard City of Vancouver lot. The contrasting colours of dark hardwood floors and white cabinetry complements the floor to ceiling window with the perfect view of the harbour, or the complex’s courtyard garden. The complex’s exterior shows the corrugated navy blue and burnt orange steel walls of the shipping containers. The development meets all building codes, and indeed exceeds code requirements for insulation and sound transference. Six units will be rented out to senior women, while the other six will be rented to low-income single mother families. The Alexander Street development features two different levels of non-market housing, six units that will cost elderly occupants $375 per month. The other six units rental cost will be determined by the resident’s annual income, with a maximum monthly rental of $850. Some potential residents have already reacted strongly to their new designer homes. Vancouver City council first investigated the concept of shipping container housing about four years prior to the development. The project was inspired by BC Hydro’s “House of the Future”, a recycled shipping container housing demonstration project, which was located on the front lawn of BC Hydro’s downtown office during 2010 Vancouver Winter Olympics. There have been similar projects built throughout Europe, but none had ever been developed in Canada before. The development was a cost effective and environmentally sensitive building option addresses a wide range of affordable housing needs. The first shipping containers were dropped on the location on November 30, 2012; donated by BC Hydro. Shortly after two more containers were donated by private investors. The remaining eight containers were purchased through a broker from Port of Vancouver. The project was completed in July 2013. The shipping container development serves to show us that with creative and innovative thinking developers and designers can work together to ensure that everyone has access to safe and secure housing. The entire Alexander Street project, including the heritage restoration of the adjacent 16-unit Imouto Housing for Young Women, cost a total of $3.3 million. The success and praise of the current project has led to the possibility of similar developments outside the country’s most expensive city. Atira Women’s Resource Society hopes to gain city approval to build a seven-storey project that would require 42 recycled containers. The development was established through Atira Women’s Resource Society with partnership with Canada Mortgage & Housing Corporation, and BC Hydro. Atira had a vision and the tenacity to see this project through a precedent setting development process, despite criticism and opposition. “We are grateful to our funding partners who stood by us. The building and individual suites look better than we ever could have imagined,” said Janice Abbott, CEO of Atira Women’s Resource Society. The development is one of the first in the world and will hopefully inspire other cities with housing problems to consider using sustainable building materials to assist low-income earners with affordable housing options.